The lovely Jade at Scatterbooker https://scatterbooker.wordpress.com/has nominated me for two awards this Monday! Now that’s woken me out of my Monday Slumber, what an unexpected, and lovely surprise. 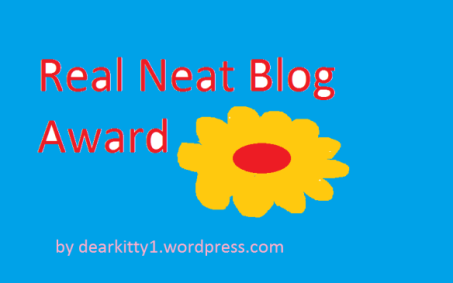 Thank you so much Jade for the Real Neat Blog Award and the Premio Dardos award. What is the best book you’ve ever read? Well I think I’m still discovering the answer to that question, but some of my favourites are: The Great Gatsby, The Picture of Dorian Gray, My Sister’s Keeper, The Book Thief, The Miniaturist, The Big Sleep, The House of Silk, which I’ve just finished reading, plus lots of fantasy novels, particularly Garth Nix’s Old Kingdom: Sabriel, Abhorsen and Lirael, Victoria Schwab’s The Archived and The Unbound, and of course Vicious, plus some romance where would a girl be without a touch of love in her life? So my favourite Rainbow Rowell is Eleanor And Park, and my favourite Stephanie Perkins to date is: Lola and The Boy Next Door. What is your favourite thing to do in your spare time? Reading! Also I enjoy Tai Chi. Love relaxing pastimes, rather than fast and furious ones! Who is your secret celebrity crush? 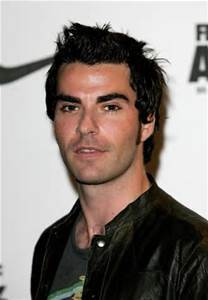 Oh this one is so easy, it would have to be Kelly Jones, from Stereophonics. Love their music and he is hot!!! Exceptionally!!!! Do you have a favourite sports team? No, I don’t really like sports much! Though I do love watching Ski racing, I’m not a great skier, but I love to watch others fling themselves off a mountain. What song is guaranteed to get you up and dancing? Dancing Queen, Abba, or I don’t feel like Dancing, Scissor Sisters. Do you have any pets? I did as a child. Lots of pets, a hamster, gerbil, gold fish, two cats, and a dog, not all at the one time but now I don’t have any. Which is a shame, I would love to, but my husband is allergic (or says he is!) If I could have one pet it would be a cat, and we have an occasional visiting black cat, which is really nice. He has a lovely shiny black coat, and a cute white patch on his neck. 1. Do you have any unusual pastimes such as pot-holing, or ball-room dancing? 2. Have you ever fallen in love at first sight? 3. What kind of books do you like to read, and do you have a favourite? 4. If you had a choice to listen to a music concert, go to a film, or the theatre, or an art/photography exposition, which would you choose? 6. What is your favourite and your least favourite food? 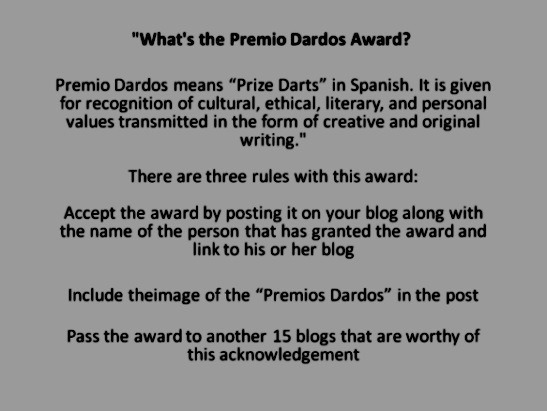 This entry was posted in Awards - Blogging and tagged Premio Dardos Award, Real Neat Award. Bookmark the permalink. You’re so sweet – thank you! 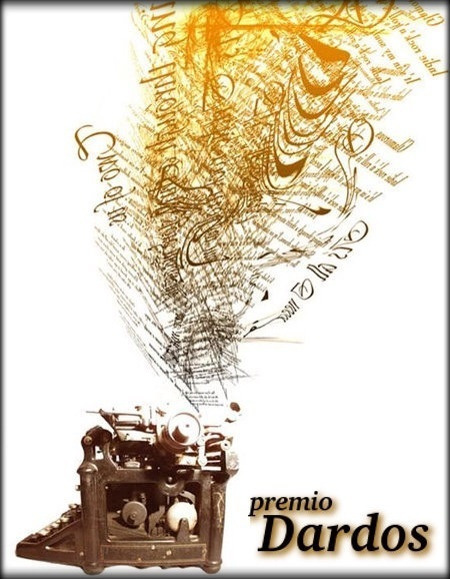 In fact, I’m an award-free blog but if someone nominates me, I add their blog link to this page: http://wp.me/p1mFAV-2rd. Thank you again. Hi. Thank you, congratulations to you too. Yes, it would be nice, maybe one day I’ll visit Malaysia again, the last time I went was about six years ago, so a re-visit is long overdue! Congrats on your blog awards! These two are new to me! Thanks so much. Yes, they’re new to me too! Hello! Thank you for the nomination! I’m currently writing my MA thesis, so I don’t have time to complete all or the aspects of this award go around, but I did some. I am happy you read my blog and I look forward to more posts from you in the future. Congratulations on your award and thank you for nominating me. That’s very kind of you. Thanks so much! Many congratulations to you too!